Alexander´s father, Philip, won several equestrian victories at Olympia and Delphi, the two most Hellenic of all the sanctuaries in ancient Greece where non-Greeks were not allowed to compete. Even more significantly, Philip was appointed to conduct the Pythian Games at Delphi in 346 B.C. 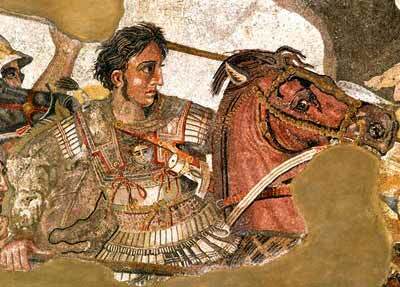 In other words, Alexander the Great´s father and his ancestors were thoroughly Greek. Greek was the language used by Demosthenes and his delegation from Athens when they paid visits to Philip, also in 346 B.C. Another northern Greek, Aristotle, went off to study for nearly 20 years in the Academy of Plato. Aristotle subsequently returned to Macedonia and became the tutor of Alexander III. They used Greek in their classroom which can still be seen near Naoussa in Macedonia. Alexander carried with him throughout his conquests Aristotle´s edition of Homer´s Iliad. Alexander also spread Greek language and culture throughout his empire, founding cities and establishing centers of learning. Hence inscriptions concerning such typical Greek institutions as the gymnasium are found as far away as Afghanistan. They are all written in Greek. The questions follow: Why was Greek the lingua franca all over Alexander´s empire if he was a “Macedonian”? That is why the New Testament, for example, was written in Greek?